The Midlands State University Fundraising Golf Tournament held at the Kwekwe Golf Club on Saturday the 10th of November, 2018 was a resounding success with overwhelming support from golfers and sponsors from the corporate world. The tournament was aimed at raising funds for the construction of the newly established Midlands State University Kwekwe Campus which will house the Faculty of Law and the Faculty of Natural Resources Management and Agriculture as well as other units. The state-of-the-art law school will be named in honour of the President of the Republic of Zimbabwe and Chancellor of the Midlands State University, His Excellency Cde Emmerson Dambudzo Mnangagwa in recognition of his role as one of MSU’s founders as well as his keen contribution to the development of the University’s legal education. Addressing guests and golfers who attended the tournament’s prize-giving ceremony and cocktail reception, Cde Mnangagwa narrated the journey that they travelled in order to bring about the establishment of Midlands State University. 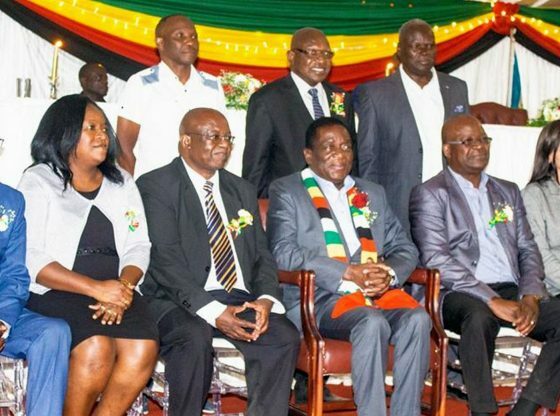 The President highlighted how he chaired a committee made up of other luminaries from the Midlands Province among them Cde July Moyo, Cde Fredrick Shava, the late Midlands Province Governor, Cephas Msipa and the late Richard Hove, with the guidance of the late Vice President of the Republic of Zimbabwe Cde Simon Muzenda. The President also commended the MSU Vice-Chancellor Professor V. N. Muzvidziwa for clearly articulating his vision, outlining the trajectory the University intends to take in order to make the envisage campus a reality, without having to go with a begging bowl to the Minister of Finance, Professor Mthuli Ncube to seek funding for the campus. ‘You have started very well. You have gathered all these people here and your message. I was listening very clearly to your message and it’s a message of hope. You are also saying, we as the private sector or as parents this is where we want to go for the benefit of our children’, he said. President Mnangagwa, further noted that peace and unity were prerequisites for the country’s development and that both the private and public sectors had an important role to play in development. ’‘All those developing and middle-income countries have only achieved those statuses because they have achieved peace in their countries. They are united in their countries, they collaborate through the public and the private sector. They work together and those projects are not their projects, they are our projects. It is my view that collectively or individually you must say I had something to do with the glory that the University is enjoying. You must say we had something to do with the glory of that institution. That alone gives you pride for having contributed to the community, to your country and to education in this country,’ he said. Speaking during the event, MSU Vice-Chancellor Professor Muzvidziwa said the Emmerson Dambudzo Mnangagwa Law School will be the flagship of the Kwekwe Campus, and chronicled some of the Faculty of Law’s achievements to date. ‘In order to promote access to justice, the Faculty has introduced a specialised diploma programme targeting paralegal officers working in the NGO sector and government departments. They have also introduced a specialised Masters degree programme in Constitutional and Human Rights Law … it is the only masters of its kind in the region … your Law School Your Excellency is pioneering the development of the legal profession in this area,’ he said Professor Muzvidziwa. Apart from contributing significantly in terms of the development of jurisprudential law, the Faculty of Law has contributed human capital to the legal profession. Additionally, the Faculty has entered into strategic partnerships with several development partners in Europe particularly in the Scandinavian countries with a view to championing the rise of persons with disabilities in the country. As a result, it has been awarded a grant and given the responsibility to mentor other law schools at the University of Namibia, the University of Botswana as well as the University of Dodoma in Tanzania. The fundraising golf tournament whose key sponsors were FBC Bank, Old Mutual, TelOne, Metbank and ZB Bank among others, attracted more than 100 golfers from across the country.